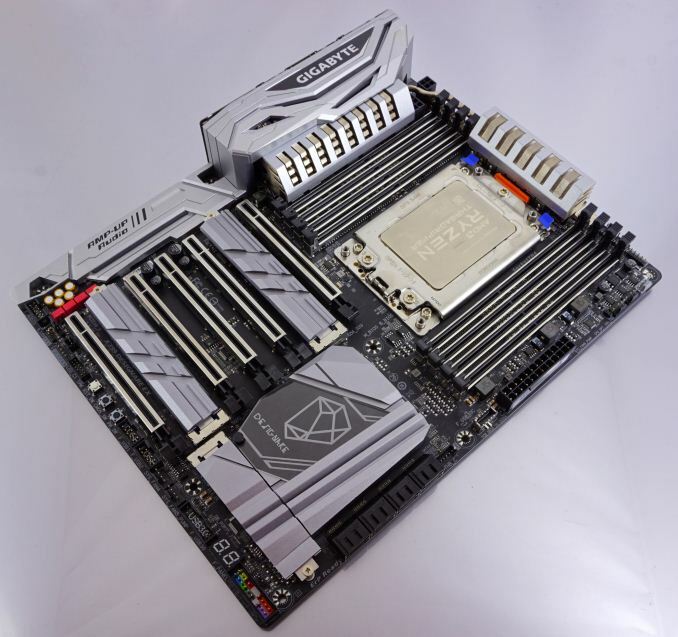 The aesthetic design of the GIGABYTE X399 Designare EX is imposing but not extravagant, with a lot of metal dominating the clean, elegant layout of the ATX motherboard. Onboard RGB lighting is limited to a relatively subtle implementation on the chipset's heatsink. If that is not enough light for you, there are three headers for RGB/RGBW/RGBUV strips/panels. Two headers support regular 12V LED products and one header supports 5V/12V digital LED strips. GIGABYTE claims that the headers can support up to 300 LEDs combined, enough to illuminate a small apartment. GIGABYTE is using the true eight phase VRM design for the power delivery to the Ryzen Threadripper CPU. Each phase features an International Rectifier (Infineon) IR3556 MOSFET driver and a "server-level" high-efficiency choke. An IR35201 digital controller by International Rectifier is controlling the power circuitry, evenly distributing the load across the eight phases at all times. This technique prevents having one or two phases heavily loaded while the rest are idling and greatly improves the longevity of the components. GIGABYTE placed significant focus on the cooling of the motherboard and other components. The two sizable heatsinks that cool the processor's VRM circuitry are connected with a heatpipe and are actively cooled via a small fan hidden behind the I/O ports. GIGABYTE supplies heatsinks for the M.2 drives and they are very cleverly implemented; the heatsinks latch into the socket along with the drive and use a thermal pad instead of a permanent sticky tape. The use of metal is extensive, even perhaps excessive, on the X399 Designare EX. All of the PCI Express and DIMM slots have metallic braces installed. A metal plate covers most of the motherboard's rear and, while it may seem like a heatsink, it does little more than enhancing the mechanical strength of the motherboard. 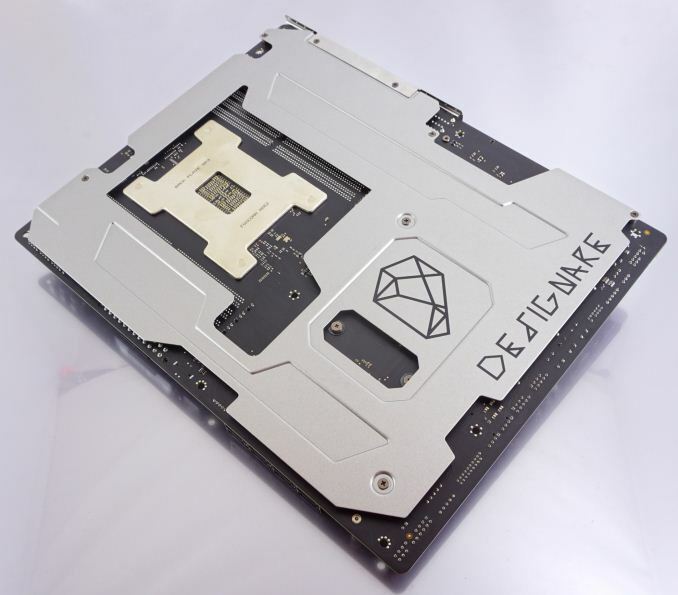 It would appear as if the Designare was getting ready for super-heavy tower CPU coolers. Only the covers above the fan next to the power delivery and the audio circuitry are plastic but the careful paint job conceals that fact. 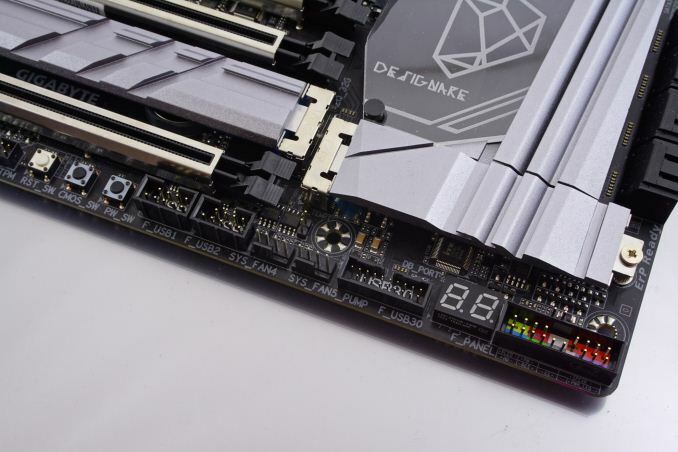 The mechanical strength enhancements GIGABYTE implements are definitely excessive, especially on the DIMM slots, but they do at the very least enhance the aesthetics of the motherboard. The motherboard's layout is very well thought out, especially for a motherboard with that level of integration. The majority of the headers have been placed across the bottom edge of the motherboard, while all of the SATA connectors have been grouped together next to the chipset and are facing rightwards. Two small headers lie between the SATA connectors and the ATX power connector for USB. The top connector with the metallic frame is for a Type-C port but note that it is limited to USB 3.1 Gen 1 speeds (5 Gbps). The other connector is a THB-C header for a Thunderbolt add-in card but there is no mention of it in the motherboard's manual, the manufacturer's website, or anywhere else. It appears that GIGABYTE had plans to integrate Thunderbolt support onto the X399 Designare EX but these did not bear fruit. 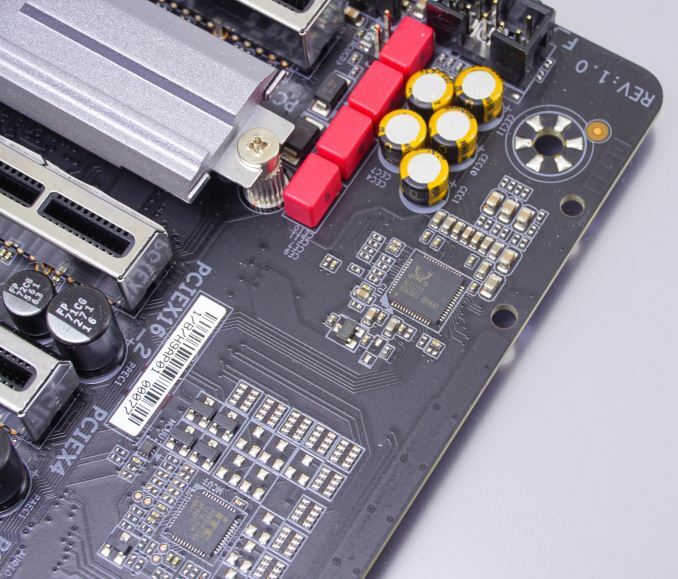 Not one, not two, but five fan headers can be found at the top right corner of the motherboard. The grey header is meant for the CPU's main fan. There are two more fan headers at the bottom edge of the motherboard and one more right next to the left VRM heatsink. The latter is occupied by the hidden VRM cooling fan. Two of the headers (SYS_5), one at the top and one at the bottom of the board, have been enhanced to support liquid cooling pumps. The number of thermal sensors is extraordinary as well. 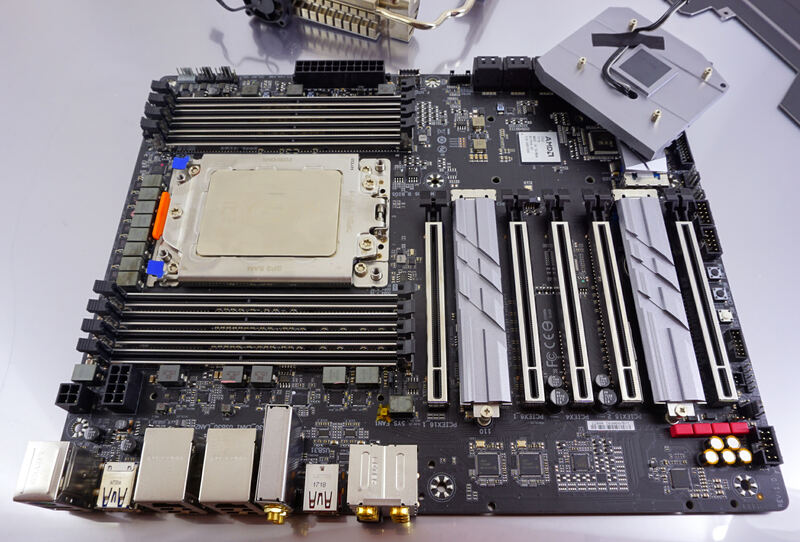 Along with the two headers for the extra thermocouples, the X399 Designare EX also has another seven thermal sensors integrated on virtually every critical part of the motherboard, from the VRM/chipset heatsinks to the audio circuitry. 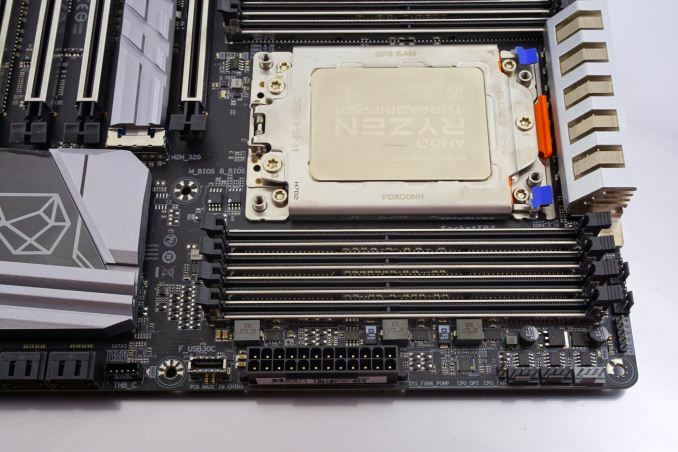 At this point we should also note that the X399 Designare EX has the lowest number of power connectors that we have seen on any AMD X399-based motherboard. 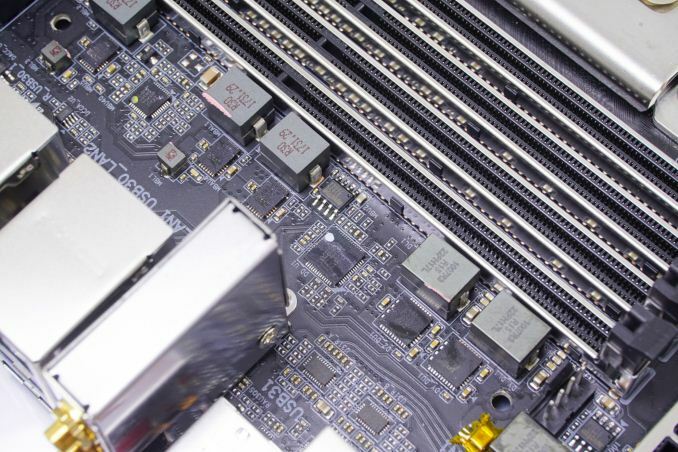 Aside from the typical 24-pin ATX and 8-pin 12V CPU connectors, there is only an additional 4-pin 12V CPU connector. All of the other AMD X399 motherboards have either two 8-pin CPU connectors or a fourth connector of another type, or even both. Apparently, GIGABYTE is confident that their power circuitry is very efficient and capable of handling both a stressed Ryzen Threadripper and a multi-GPU setup without additional connectors. It will be interesting to see this board with a Threadripper 2 in it later this year. The audio circuitry of the X399 Designare EX is interesting as well. It is using the Realtek ALC 1220 chipset that has a maximum rated sound-to-noise ratio (SNR) of 120dB. This is the same chipset that every other AMD X399 motherboard is using but GIGABYTE clearly placed a lot of weight on the motherboard's audio, trying to enhance it as much as possible within economically feasible levels. 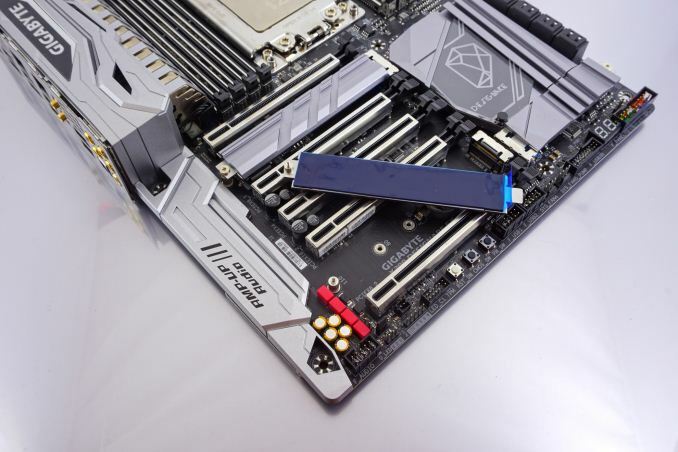 GIGABYTE went for the little things that make a subtle but clear difference, such as audio-specific capacitors supplied by Nichicon and WIMA, and gold-plated jacks. The audio circuitry is not isolated on this board but there apparently any room for the designer to achieve that. The Creative Sound BlasterX 720° that GIGABYTE mentions in their website is a software package that can be installed to add some software-level advanced audio features and cannot affect the physical performance of the audio circuitry and/or chipset. 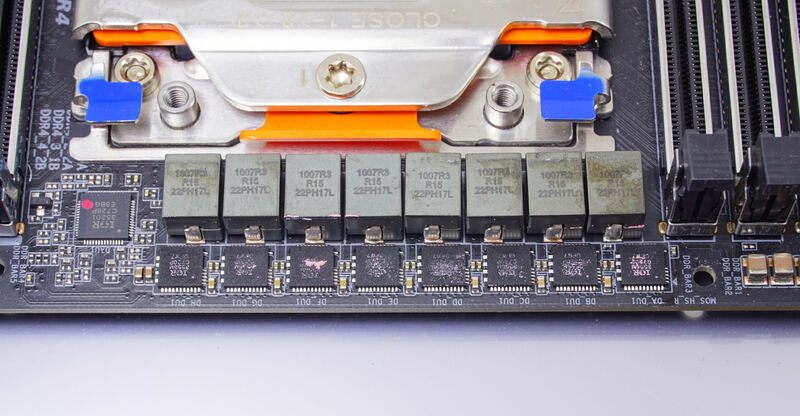 The rear panel of the X399 Designare EX is littered with USB connectors, which start from the top of the board and extend all the way down the audio jacks. 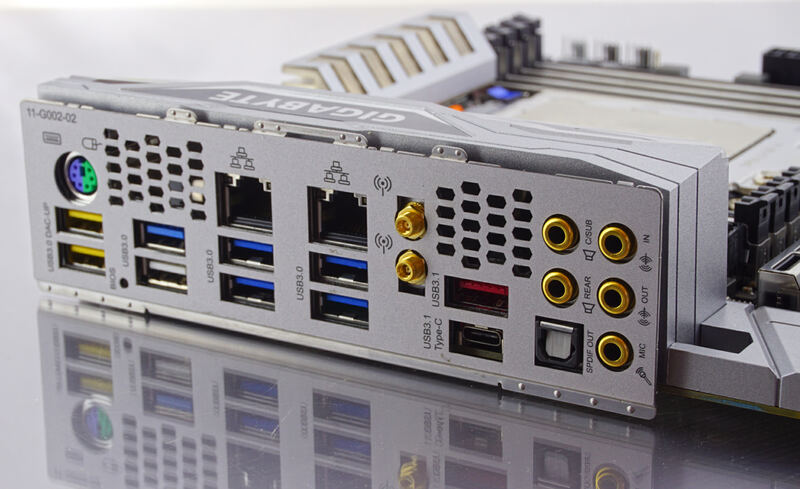 The top eight are USB 3.1 Gen 1 connectors, with the top two featuring enhanced power delivery (DAC-UP). The white USB 3.1 Gen 1 port supports Q-Flash Plus, a handy feature that allows the BIOS to be updated even without a CPU or RAM modules installed. The red Type-A USB port, as well as the Type-C port beneath it, is a USB 3.1 Gen 2 port with a maximum bandwidth of 10 Gbps, provided by an ASMedia 3142 controller. There are five gold-plated 3.5 mm audio jacks and one optical SPDIF connector, forming the standard configuration of the Realtek ALC1220 audio controller. Finally, there are two wireless antenna connectors for the Wi-Fi and Bluetooth connections. BTW this Board has a THB_C Header. Intel still hasn't actually opened up the licensing. They said they were going to like 2 years ago at this point, but have managed to drag their feet through avoiding actually pulling the trigger to the present day. The boards are pretty much identical except for second Intel I211 ethernet replacing the Killer ethernet. B oth boards sport 2x GB ethernet and onboard 1200AC wireless. They both have 5x metal-clad x16 slots with the middle one disguising an x4 slot. They both have 3x pcie gen3 M.2 slots in the exact same places. They both have 8x sata3 ports and the same number of external & internal Gen 1 USB3 3.1 ports the same 2 USB gen2 ports - one 'A' and one 'C'. The number of power phases and audio controller + capacitors and software. In fact the only distinguishing features I can see are the metal backplate while the Aorus is littered everywhere with with RGB leds, the differing second ethernet port and possibly the M2->U2 adapter.